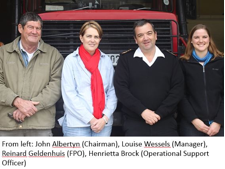 Five local FPAs are getting ready to join the Greater Overberg FPA, which is expected to be launched at the beginning of next year to boost the fire-management efforts of landowners in the region. The District Fire Working Group gave the go-ahead for the launch of the new FPA in September this year and six FPAs have already joined. These are the Bredasdorp Vlakte, Swellendam / Ruggens, Overberg TWK, TWK Groenland, Babylonstoring and Sondagskloof FPAs. This news follows discussions lasting over two years between farmers and other rural landowners, about the formation of the district-wide FPA. A key step came in September, when the draft results of a GEF-funded study were released, with findings on the best way of structuring and funding FPAs, and their optimal functioning. This study supported the formation of a district-wide FPA with smaller Fire Management Units (FMUs). The first amalgamations are now under way, with the support of the Overberg District Municipality Chief Fire Officer, Reinard Geldenhuys, and co-ordination by Henrietta Brock, the GEF FynbosFire Operational Support Officer. This work includes the expansion of Bredasdorp Vlakte FPA to the boundaries of the Overberg District Municipality (except for areas covered by FPAs not yet joining), the renaming of the Bredasdorp Vlakte FPA to Greater Overberg FPA and the dissolution of those FPAs ready to join by December this year. Members are also discussing the locations of FMUs, which will separate areas with different fire management needs due to location and land use types, while making use of existing structures such as famers’ unions and smaller FPAs where suitable. They will then also vote for a representative/manager from each FMU.